Media cabinets play an important role in the process of creating a functional and modern living room. The media cabinet usually defines the center of the living room and acts as a focal point in the interior. Therefore, the design, shape, size and style of the media cabinet can have a major influence in providing the living room interior with specific aesthetic touch. A specific hot trend in nowadays furniture design is the floating media cabinet, that is a great element for creating a sleek and contemporary ambiance in the living room. The floating media cabinet will not only create sleek appearance of the living room, but it will also help you to optimize the space in the interior. 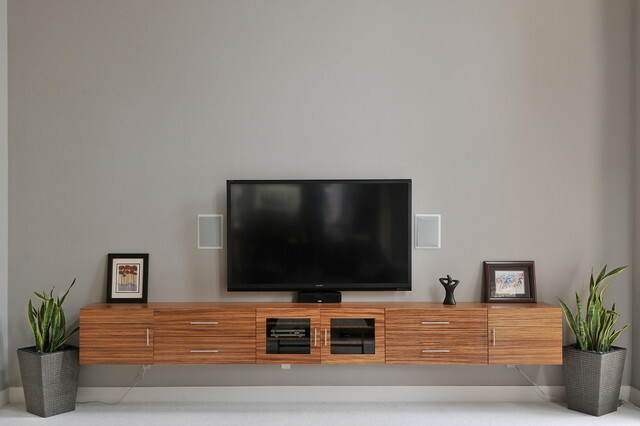 Take a look at the below list of super modern and contemporary floating media cabinets. The black wood floating media cabinet with sleek and sharp design act as a superb focal point in this living room and striking on a white plain wall create a perfect high contrast. The big and natural floating cabinet surely provide this superb living room with natural and contemporary statement. The big size and smart design provide the floating cabinet with neat and sleek outlook. Wow! So sleek and modern, right? The dark wood in combination with the wide design make this floating media cabinet a perfect element for creating a contemporary and organized setting in the living room. The sleek and clean surface of the dark floating media cabinet provide it with super contemporary and modern outlook, that will surely help you to create a charming and modern appearance of your living room. The floating media cabinet with open display concept and with extra storage is a perfect element for creating a modern and organized ambiance in the living room. Wow! We love this super modern and natural floating media cabinet with accented surface and overly wide and modern design. A floating media cabinet like this one, can surely work as focal point in the living room and provide the place with modern and bold statement. We love how sleek and natural this floating media cabinet looks. The unfinished wood design in combination with the floating concept provide the media cabinet with ultra contemporary and bold charm. So sleek and rustic, right? The rustic wood addition to the contemporary black and white floating media cabinet provides it with natural and beautiful charm that can surely act as a focal point in the living room. The wide floating media cabinet with noisy surface create a bold and awesome visual effect in this super eclectic and cool living room. We love the overall appearance of the natural rustic floating cabinet with noisy surface. The combination of chest and regular drawers make this wide and modern floating media cabinet a perfect element for creating a bold and modern statement in the living room.